Facebook yesterday updated its iOS app to version 5.4, giving users a few new features in what could be one of the world’s most complex and layered mobile apps. The update brings with it the ability to share voice messages, much like iOS’s Voice Memos, letting users record a cute little message and send it through the app to friends. The update also lets users record and share video from right within the app. Facebook users have long had the ability to send 60-second voice messages within Facebook’s Messenger app, but the functionality has been brought over to the main app. 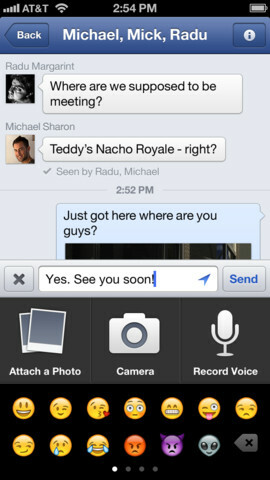 Users can send a voice message by tapping the plus button under the Messages tab. From there, click Record and simply hold the button to record your message. When you release, your message will be automatically sent unless you slide your finger off the button, in which case the message will be canceled. Along with video and voice functionality, Facebook has also improved Places support on the app’s Nearby tab, letting users check in with a bit more accuracy. Facebook has struggled on mobile, but there have been clear improvements in the past year. The company has introduced various mobile apps like Poke, Messenger, and Camera, while still making clear progress on the main Facebook app. In fact, Zuckerberg believes that mobile is where the money is. The update is available for free in the App Store.